When Louis Schmitz died in late December 2011, Farmington lost a legend who gave so much back to the city he called home for more than 58 years. 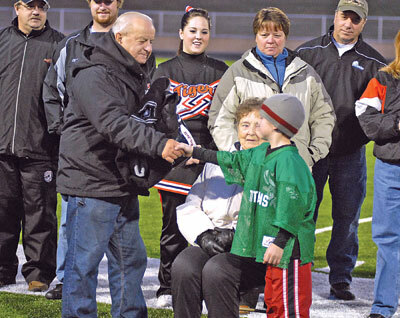 His legacy as a pioneer of youth sports in Farmington and founder of the hockey program continue to live on. But those who knew Schmitz best were inspired to carry out his mission of giving back through a foundation in his name. “One of his philosophies was that if a kid wants to play sports, money shouldn’t be the reason they can’t play,” said son Randy Schmitz. His father would find equipment and help find ways to pay for fees of youths who could not afford sports. After Louie Schmitz’s funeral, former players and his nine children began talking about carrying on this legacy and the idea of the Louis Schmitz Foundation was born. Now more than 30 people sit on the committees that decide how to donate money in Louis Schmitz’s honor. With this idea in mind, the money raised will go back to the community in three different ways: through two $2,000 scholarships for a male and female student at Farmington High School who have athletic or volunteer experience, financial assistance to youths who cannot afford participation fees, and a community project fund. The foundation donated $500 at the May 20 City Council meeting to help pay for Parks and Recreation fees. The annual contribution will forge a new partnership between the city and organization. Mayor Todd Larson said Louis Schmitz was one of the first adults he met when he moved to Farmington at age 10. It’s these stories that help continue to keep Louis Schmitz’s memory very much alive in Farmington. And how would Louis Schmitz react to this? “Dad was pretty humble, and he would be humbled by it,” Randy Schmitz said. The foundation raises money through a golf tournament. The second annual tournament is at 11 a.m. Friday, June 21, at Southern Hills Golf Course and still has a few spots open. For more information on the foundation, visit louisschimtzfoundation.org.